Social media marketing is gaining more and more complexity as there are always new options added and user behaviour being in a constant evolution. Narrowing down on the right strategy for Facebook can feel like a daunting process of never ending optimisation. We have put together the most important aspects to be successful on the biggest social network. With these social media marketing tips, you will become a fearless Facebook Marketing pro. Every Facebook marketing strategy should be based on two factors. With a focus on brand marketing you can build a long-lasting brand image and persona. You are introducing your brand to the world through your profile. Sharing content for your followers to be able to directly and intimately communicate with you. Helping you to build authentic connections with your fans. The other important aspect of your Facebook strategy should involve direct marketing. Direct marketing aims to sell your products through Facebook specific Ad & retargeting campaigns. For this approach conversions and immediate ROI are more important and significant than with the long-haul strategy of branding. Both strategies operate on different timeframes but are still interrelated as a well-balanced approach to positioning your brand and selling your products on Facebook. How to create a business profile on Facebook you can read about here. Just fill in all the important information, upload a profile pic and you are ready to go. What you want to achieve and how you want to get there should be part of your consideration. There are a few key factors though that are important whatever your strategy looks like. Let’s dive right in! Simple, yet the most important thing to be aware of: You have to consistently create interesting and engaging content to stay connected with your followers. Ongoing interaction will build your brand. Creating, managing and posting a lot of content can become a full-time job in no time. 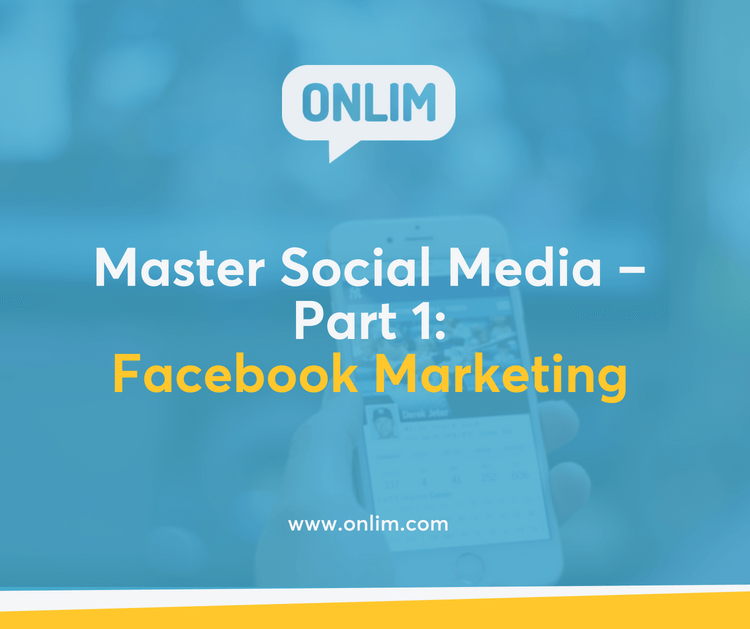 To make life easier for you there are social media planning tools like Onlim out there. Onlim helps you to manage and automate your social media tasks, saving you a lot of time and effort in the process. Check it out here. Do us all a big favour and don’t be the next boring brand on Facebook. Be creative, be brave and give that special touch to your brand. You have a great personality, let it shine through. It’s up to you if your brand comes across as intriguing or boring. Create more videos! Really, do it! Visual content working very well is not even a trend anymore. It is the baseline for your success by now. You have to create videos to actually make a mark on social media and on Facebook. Interactions with video content are a lot higher than with any other. That’s why you are in dire need for a video strategy. Make sure to add captions to your videos too as not everyone is able to listen to them while on the go. Video content is that important. It deserves two spots on our list. Live video is the next big thing and engagement numbers are skyrocketing. There is no other way of communicating as directly with your fans as being live. It’s loads of fun and creates a lot of reach too. Facebook messenger is taking over the role of email for customer support. A customer wants a question answered now and not tomorrow. Make sure to be available for a chat right away as this will increase your sales tremendously. This is where chatbots and automated messages shine. They are instantly available and create a direct connection with your followers. Onlim has some amazing solutions for your chatbot and automisation needs. Learn more about them here. This is where direct marketing comes in. With Facebook you have fantastic options to segment your audience and send the most fitting offers to those who want them. Getting your ads perfect is a process of trial and error. Be sure to do some thorough A/B testing on your ads and built on your most successful ones. Figuring out what works best does not have to be a guessing game. Make good use of Facebook’s implemented analytics tool and you will have amazing insights available to fine tune your strategy. Checking Facebook is a way to escape the boredom of everyday life for a few minutes. Not everything has to be all that serious for those brief moments. A professional approach to Facebook marketing is important but that does not have to be in your way of having fun with it. Connecting with people is a joyful and light experience. If you are having fun, your customers will notice. These Facebook marketing tips are setting you up to get started and will help you make sure that you are using the platform to its fullest potential. If you do have any more questions, feel free to shoot us a message over our live chat.